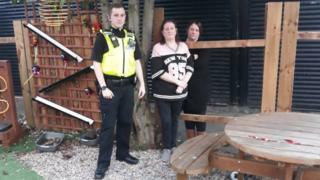 Vandals have ransacked a sensory garden for children with autism. Wooden fencing was torn down, a shed was broken into and sensory equipment was stolen from the Downhill Centre in Sunderland sometime over Saturday night. The organisation which runs the garden on Killarney Square said the attack was "devastating" and "heartbreaking". Northumbria Police are appealing for information. PC Daniel Armstrong called the break-in "absolutely disgraceful". He said: "Crimes like this understandably cause a great deal of emotion and anguish among the community. Image caption PC Daniel Armstrong said the attack, which included damaging the shed, was "absolutely disgraceful"
"This is a local support group run by volunteers who show incredible levels of determination and kindness to help some of the most vulnerable individuals in our area." Marie Jevon, the founder of the garden's owners Include 'In' Autism, said: "We are absolutely devastated by what has happened. "My heart is broken for the children, and I hope those responsible can live with themselves knowing they have caused such upset and anguish as a result of their actions." An online fund has been launched to repair the damage, replace the stolen items and improve the site's security.